The 2018 Emmy race is here, and Vulture will take a close look at the nominated contenders until voting closes on August 27. 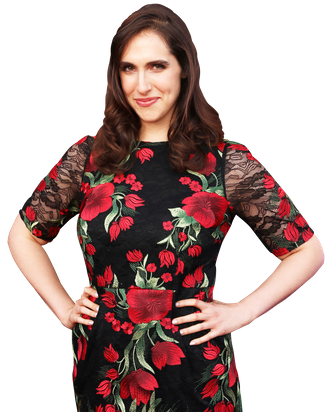 No person has taken the Emmy Awards by storm this year quite like Megan Amram. Back in April, the comedian, television writer, and author made the Emmy submission deadline at the very last minute with the release of her six-episode comedic web series An Emmy for Megan, in which Amram meets all of the minimum requirements to qualify for an Outstanding Actress in a Short Form Comedy or Drama Series nomination. When the nominations were announced last month, Amram was not only recognized for her acting, but received a second nomination as a producer in the Outstanding Short Form Comedy or Drama Series category. With the illustrious awards ceremony now just weeks away, we caught up with Amram yesterday to discuss her Emmys plans as well as the next phase in her distinguished and award-worthy comedy career. Megan, thank you so much for talking with me today. Thank you for talking to me and supporting. Really combines a lot of your favorite stuff! I also like the way you spell your name. I like that there’s like a floating “H” at the end. There were seven Meg(h)ans in my grade when we all started getting Instant Messenger, so the “Megh” was bestowed upon me then. How old are you if you don’t mind me asking? I am 30 and very soon to be 31, and I feel like we are prime, prime Megan territory. It wasn’t even that many years that there were so many of us. Like, there aren’t any Megans anymore. I’ve seen some weird ones, like, M-A-G-E-N. I don’t want to stay on the Megan topic for too long, but I hate when it’s pronounced like egg. When people say “Meggan” it drives me nuts. Yes. I had a roommate in college named Megan, spelled the same way as mine, who was convinced we had different names. I always say mine “Megan,” just like a flat vowel I guess. And hers was like … big. That’s peak Megan: Just trying to find ways to be unique despite being one of a million. Anyway. Let’s talk about a very important thing: Your Emmy nominations. First of all, congratulations, you’re over the first hump. Thank you. I mean, in some ways yes, I’ll accept your congratulations. But also, I don’t think congratulations are in order until I stick the landing, because no one remembers someone getting nominated. Basically everyone is very close to getting nominated for an Emmy — everyone in the world — but I just think the greatest honor of all time would be winning one. So, the series is called An Emmy for Megan, not called Two Emmys for Megan. Are the two nominations screwing things up for you? Yeah, it was really tough when that happened. I had not fathomed how I would be recognized for both my acting and my general producing of my series, and I’m overjoyed that I was recognized. You know what? I take it back — being nominated is an honor, I thought about it. But I think it’s something that I’ll definitely have to comment about, should I win two of them: Does it take away from the integrity of my campaign? I don’t want anyone to think that I was lying to them or being anything but very forthcoming and truthful the whole time. So this wasn’t intentional. I wasn’t trying to lie and say I only wanted one when in actuality I want two. But these are the kinds of things that I guess actors, like famous awarded actors, have to deal with. I didn’t know! I read that you had a plan B in case you hadn’t been nominated. I assume you have a plan B in case you don’t win. Is that accurate? I mean, the good thing if I don’t win — and again, I really want to win, so it’s not gonna be great if I don’t — but if I don’t, the silver lining is that I think An Emmy for Megan season two would have so much more real, intense backstory behind it, since everyone who watched season one and read these interviews has lived through it with me. I think season two would be a lot darker then. Maybe it’d be a revenge story? Maybe it’d be a true coming-of-age where I have to get in touch with what happened? Maybe I write a book like What Happened, the Hillary Clinton book? I feel like that’s probably the best option: I try to win a Pulitzer for my book about why I lost. I also feel like season two, for a lot of shows, is where things hit their stride and viewers really start to connect. Right! Because now I understand the character and I have found what the show is about. It took a few episodes of season one maybe to figure out that what the show was about was I wanted an Emmy. Like, you don’t get that right away. Maybe by episode three. So, yeah, season two will just be really streamlined, but also, I really want to do stunts and I really want to be hit by a car. I want to be like Tom Cruise and I want to do all of my own stunts. It wouldn’t even be that expensive. We would just have to find someone with a car who could hit me with a car. Speaking of stunts, your violin playing in the show is just … I don’t have words for it. Thank you! That’s always what I want to hear. I was recently talking to my mom about how the 20 years of violin lessons I took have really paid off by facilitating my possibly award-winning turn. But I do play violin. I do feel like this has inspired me to practice a lot more. If anyone wants me to play at their wedding, I truly would be happy to do that. I’ve been following the campaign with the billboards, the yard signs, the screening. What have you learned from this in terms of how to make a successful Emmy campaign? But I have to say, I very sincerely have been blown away by how much fun people either in or out of the Academy have had with being a part of the team by printing out flyers or putting up lawn signs. It has turned into a thing that I think a lot of people are doing together. So even though my name is Megan and that’s in the title, it’s really about a lot of other people. It is an Emmy for a lot of people. The fun part of the Emmys, I think, is wearing expensive clothes and having an acceptance speech that everyone blogs about the next day. Do you have any sort of sneak peeks of what we might expect from you? For the clothes, I thought, “Do I want to wear something that has to do with the series? Do I want to wear a dress that has my face on it, or maybe just one of the billboards wrapped around me?” And I decided against that, because I was like, “This is a serious thing. I’ve never gotten to be an Emmy nominee before. I want to treat this as if it’s the first and last time I’ll ever get to do this.” So I am planning on just cleaning up and looking good. But for the speech, I don’t know if you know, but this is the first year that the Creative Arts Emmys is going to be televised on FXX on September 15. And I want to believe that they decided to televise it because they’re wondering, if I win, what sorts of crazy things I’m gonna say. And that I will deliver on. I don’t want to assume the outcome of all this, but let’s say you win. What comes next for you? It’s already been something that I’ve been thinking and planning about, because you want to have contingency plans for everything. But, if I win, this is not going to stop. It’s only going to become a greater and bigger movement. I feel like I have thousands of people on my side now who really love the bluntness with which I’ve gone about this. It truly seems like the only option is that I have to try and get an EGOT. Of course. Its a real no-brainer, but An EGOT for Megan is clearly in my future. You know, I’m working with my wonderful producers Dave [Kneebone], Janel [Kranking], and Joe [Carnegie], and I’m trying to see how we can knock all these awards out as quickly as possible before the momentum slows down. So we’ll see! We’ll see. It will be announced soon.